I really enjoyed this Mr. Freeze story but the art was strange. 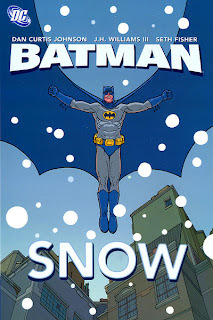 It wasn't good art to accompany a Batman story. Everytime Batman is on the scene, there are these weird cartoony bats flying around him. Annoying. This is an anthology of collected tales. I enjoyed them all but the Wonder Woman/Clayface story didn't thrill me. I borrowed this one from a friend who argues with me over comic book Joker vs. Heath Ledger's Joker. I say Ledger was good but it didn't satisfy me completely. He argues that it was a great interpretion of the character. So, he hands me this graphic novel and, of course, it's patterned after the Ledger version of Joker. It was very, very, very dark and very, very, very bloody. It painted the Joker more as a morose serial killer than the crazy Batman villain I'm used to. It's okay if folks want to reinterpret Batman or any other superhero. It doesn't mean I have to love it. The story is fine and the art is quite good. It just doesn't seem like the Joker to me. This collection centers on individual stories about failures and guilt suffered by various JLA members. I guess they can't triumph all the time. It was okay. It read very much as if DC was trying to Marvelize their characters...make them more human, more fallible. I think it works for some characters and not so much for others. On a side note: I do have some real books (all words, no pictures) coming in at the library. Hopefully there will be a mix of reviews in the near future and not all comics. It all depends on whether I can get into those books or not.